Enzzo Barrena lives and works as a freelance artist in Mexico. Born, raised and educated in Perú, he moved to the Maya’s country to raise a family . His artistry is mainly inspired by human condition, he captures visceral and mournful scenes with a deep emotionality. 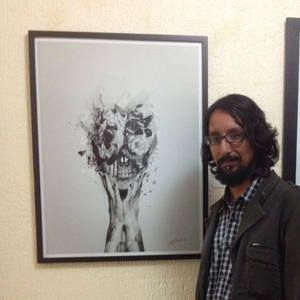 Barrena is able to reach a universal audience with his unique art. He has touched and inspired admirers across Japan, India, Russia, Poland, France, Indonesia, Turkey, etc. His work can connect so readily with an international audience because those subjects that he focuses upon – themes of loneliness, sadness, heartbreak, love, and suffering – all transcend beyond culture and language. Utilizing sincere color schemes and a recognizable body language with his subjects, Barrena reflects on the human condition, establishing a deep connection with his viewer. Barrena absorbs cultural aesthetic in his daily life and transforms it, proving with his work that subjects and concepts can be both ugly and beautiful at the same time. His artistry is indeed supported by his work as a professional graphic designer: a path which originally led him to begin his digital artwork as a hobby. Though his works may be labeled as “surreal,” the artist himself avoids defining his work. “I create my own 'reality,'” he says, “where identifiable elements converge inside of an imaginary context.